The Charles H. Scott Gallery is pleased to present an exhibition by Austrian artists Sabine Bitter and Helmut Weber. 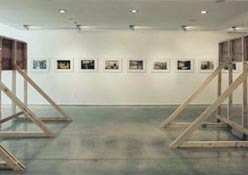 Working collaboratively for the past ten years, Bitter and Weber focus on the field of architecture and urbanism, exploring the conditions of urban life in relation to the distribution of power. They investigate the possibility of visually interpreting and critically commenting on urban and architectural structures in terms of their potential for extensive social change. The work in the exhibition at the Charles H. Scott Gallery is a result of a six month urban research project the artists carried out in Caracas in 2003. In "Caracas, Hecho en Venezuela" Bitter and Weber question the way in which the modernist promise of shaping the city and social space has been transformed due to shifts in urban, national, and global economies and politics. They examine how architecture, urban structures, and entire territories in Caracas have been appropriated, "re-territorialized", and transformed by the people who live in them. The exhibition includes photography, video and billboard projects. A 48 page, full-colour artists' book co-published with Revolver - Archiv für aktuelle Kunst will accompany the exhibition.